I am very pleased. Thanks so much for a nice clean house! - J.G. I thought your cleaning processes and the cleaning products used were wonderful. Your team did an exceptional job. It was a night & day difference. - R.R. My home was amazing when I arrived last night. What a pleasure coming home. Thank you!! - C.T. "My home was amazing when I arrived last night. What a pleasure coming home. Thank you!!" -C.T. "I thought your cleaning processes and the cleaning products used were wonderful. Your team did an exceptional job. It was a night and day difference." -R.R. The weather is beautiful outside, and after a long week at the office you are ready to go enjoy yourself. Maybe you will go to Cedar Beach and take a few relaxing laps in th e pool. Or perhaps you just want to get in some retail therapy at The Promenade Shops at Saucon Valley or Lehigh Valley Mall. Of course, if the weather permits, perhaps you will take the kids for a surprise trip to Dorney Park. When you get home, you realize that you may need to re-adjust your weekend plans. With so many other projects to deal with this week, your home has been neglected and its clamoring for your attention. Don’t despair; help is just a phone call away. Maid Brigade of the Lehigh Valley, Pennsylvania is ready to help. Who is Lehigh Valley Maid Brigade? Allow us to introduce ourselves. Maid Brigade is a nationwide home cleaning service that specializes in residential cleaning. Our home cleaning professionals are people just like you with families, pets and hobbies. We come from neighborhoods all over Allentown, Bethlehem, Coopersburg, Emmaus, Germansville, Macungie, Orefield, Trexlertown and other Lehigh and Northhampton County locations, and we understand how busy life can become. When you call Maid Brigade in the Lehigh Valley, you no longer have to be concerned about your housekeeping. Our qualified cleaning professionals are efficient and prompt. You can count on our maid specialists to do a fantastic job every time, and to always arrive in uniform when they say they will. The residential maids for Maid Brigade in the Lehigh Valley, PA, are bonded and insured, so you don’t have to be concerned about having them in your home. In addition, the Lehigh Valley Maid Brigade uses only cleaning products that are safe for your home, family and the environment. Our cleaning agents are Green Clean Certified, meeting the highest standards in the cleaning industry. We use a four-stage vacuum cleaning system that is guaranteed to remove 99.9 percent of the dust and germs from your home. The micro-fiber dust cloths we use are made of a special weave that removes more dust, germs, grease and lime safely and successfully, so chemicals are not needed. These cloths last longer than standard dust cloths, reducing the impact on the environment. It is our goal at Maid Brigade Lehigh Valley to make your life easier, so you have more time for the things you really love. After all, who wants to spend all of his or her free time cleaning the house? 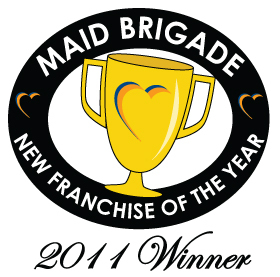 Call Maid Brigade today, so you can get back to doing the best things your city has to offer. Whether it is skiing at Bear Creek, hitting the back nine at Willow Brook Golf Course, dining at Bellissimo Ristorante or visiting with friends in Zionsville, the professionals at Maid Brigade in Lehigh Valley are here to make sure you have time for the important things in life. So call Maid Brigade in the Lehigh Valley to do the housecleaning and start spending more time enjoying yourself and your loved ones! "My wood looks especially good. I am very pleased. Thanks so much for a nice clean house." -J.G.